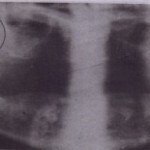 pathways for withdrawal, whereas pathways for teeth of other inclinations require the removal of substantial amounts of bone, this classification system provides an initial evaluation of the difficulty of extractions. horizontal (Fig. 9-17). This type of impaction is usually considered ‘110re difficult to remove than the mesioangular impaction. Horizontal impactions occur I~s frequently and are only seen in approximately 3% of all mandibular impactions. FIG. 9-17 A, Horizontal impaction-uncommon and more difficult to remove than me~ioangular impaction. 8, Occlusal surface of horizontal impacted third molar is usually immediately adjacent to root of second molar, which often produces early severe periodontal disease In the vertical impaction the long axis of the impacted toorn runs in the same direction as the long axis of the second molar. 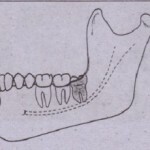 This impaction occurs with the second greatest frequency, accounts for approximately 38% of all impact” and is t rd in difficulty of removal (Fig.9-18). Finally, the istoangular impaction is the tooth. with the mo t difficult angulation for removal (Fig. 9-19). In the distoangular impaction the long axis of the third molar is distally or posteriorly angled away from second molar. This impaction is the most difficult to remove because the tooth has a ithdrawal pathway that runs into the mandibular ramus, and its removal requires greater surgical int~rvention. Distoangular impactions occur uncommonly and account for- only approximately 6’Yo) of all impacted third molars. Erupted third molars may be in a distoanguli\r position. When this occurs, they are extremely difficult to remove routinely, compared with the removal of other erupted teeth.